The Samsung Galaxy A8s, which is set to be the world's first Infinity-O display phone, has had all of its details officially released today. There are also real-world photos of the phone now available. This announcement confirms the A8s' previously-leaked specs, including the existence of two RAM SKUs and the Infinity-O display. 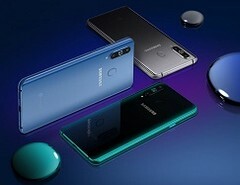 Samsung has chosen the Galaxy A8s as the first of its phones to include the next-generation Infinity-O display technology. This is a notch-alternative that puts the front-facing camera (or cameras, perhaps) right into the screen in one corner. A new series of images may show how that will work out in real life for those who purchase the upcoming mid-ranger. The A8s was launched in China today, confirming the phone's 6.4-inch, 2340x1080 display, which was known from its recent TENAA certification. This display will have a 19.5:9 aspect ration and 2.5D glass. The Infinity-O camera will give this panel a 91.56% screen-to-body ratio. The phone will be available in blue, a dark shade of green and the faded-black seen in the TENAA listing. There are also 'real-life' images of the Infinity-O part of the display available. These seem to indicate that the 'punch-hole' camera will have a rather stark black border around it, which matches the impression of the screen. It also seems that Samsung is managing the status bar by centering it horizontally alongside the camera in the UI. This looks acceptable, although it leaves at least a millimeter of empty space between the status bar and the top edge of the phone. The Galaxy A8s will indeed be powered by the Snapdragon 710 processor, and will come with 6 to 8 GB in RAM and 128 in fixed storage. This capacity can be expanded with up to 512GB of external memory. Other specs, including the battery capacity, triple rear cameras and rear-mounted fingerprint sensor match those of the TENAA listing. The Galaxy A8s will also have dual-SIM capabilities - with dual 4G - and run Android 8.1 (Oreo) out of the box. SamMobile reports that the phone will be available without pre-order on December 21. This is indeed 4 days after the release of the Huawei Nova 4, a phone that, according to its leaks, will have a punch-hole camera of its own. This may seem like a blow to Samsung, who may have wanted to be first to bring such technology to market. On the other hand, the company now has the advantage of being able to wait and see how the Nova 4 - and its pricing scheme - will be received and possibly adjust accordingly.